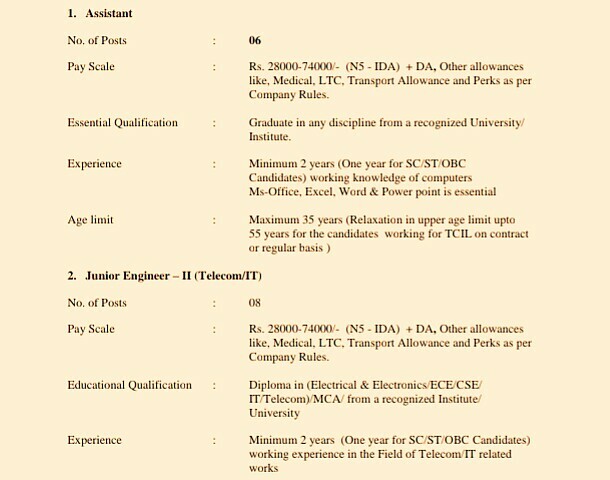 Telecommunications Consultants India Ltd. (TCIL, Is Appointing Eligible Engineers. So Interested People Can Apply For This Job Through Online Mode, From 05th Of April, 2019, Onwards. Various Assistant Engineers/Junior Engineers Posts →28 Vacancies, Kindly Do Check Out The Images Below For Name Of The Post, Number Of Vacancies, Age Limit, Education Qualifications, Pay Scale, Experience. (Credit- The Official Advertisement TCIL Recruitment 2019). B. 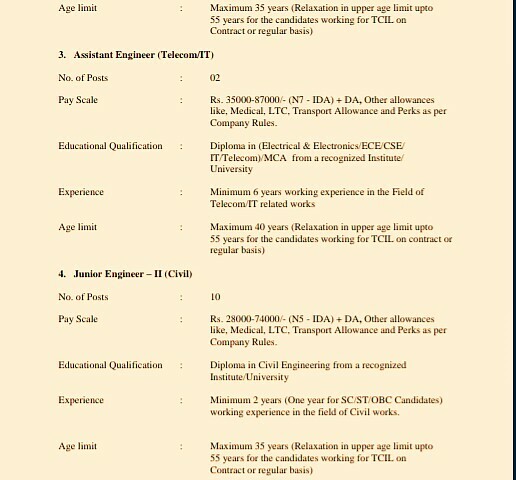 Eligible Criteria For Assistant Engineer/ Junior Engineers Job Vacancy In TCIL Recruitment Notification 2019. Age Limit →Check Out The Images Above. Educational Qualifications →Again Go Through The Image's Above. Mode Of Examination/Selection Process →The selection will be based on the written test comprising of objective/subjective both (General Knowledge/General English & Technical Domain Knowledge). The duration of the test will be 2 hrs. Online Application/Examination Fee →The candidates will have to deposit Rs. 1000/- through DD in favour of “TELECOMMUNICATIONS CONSULTANTS INDIA LIMITED”, payable at “Delhi” for each application alongwith the printout of the online Application sent to TCIL. The SC/ST Candidates are exempted from the Application fee. Last Date For Online Application Form Submission →18th Of April, 2019. For More Info →The Official Website Of TCIL, India. Now Apply For This Job Of TCIL For Assistant Engineer & Junior Engineers Posts. Thank You For Your Continuous Support And Love, Till Then Stay Safe And Blessed.